Creator: Louis Prang & Co. Description: The August 1864 Democratic national convention in Chicago is unfavorably compared to the Republican convention in Baltimore in June of the same year. The artist is especially critical of prominent New York Peace Democrats Horatio Seymour and Fernando Wood. The party’s espousal of a truce with the South is presented here as advantageous to the Confederacy and to Great Britain. The cartoon is divided into two panels: “Baltimore” (left) and “Chicago” (right). In Baltimore, Liberty says to the seated Lincoln, “My fate I trust in your hands go and do your Duty!” She is accompanied by the American eagle. Lincoln holds his Emancipation Proclamation. His platform is upheld by supporters (from left to right) Massachusetts senator Charles Sumner, Union general Ulysses S. Grant, and Union admiral David Glasgow Farragut. Behind them are a soldier and a man wearing a labor cap. At right, a dwarfish Democratic presidential candidate George B. McClellan is thrust onto a tiny round platform made of cheese by Copperhead leader Clement Laird Vallandigham. 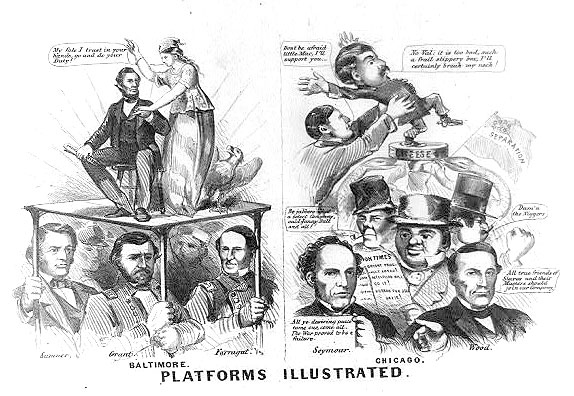 The reluctant McClellan entreats, “No Val: it is too bad, such a frail slippery box, I’ll certainly break my neck!” Vallandigham tries to reassure him, saying, “Don’t be afraid little Mac, I’ll support you.” The platform is supported by snakes, representing the Copperheads or Peace Democrats, one holding a Confederate flag of “Separation.” Nearby a street tough in a top hat, smoking a cigar, holds up his fist and says, “Dam’n the Niggers,” while an Irishman with a clay pipe observes, “Be jabbers what a select Company, ould Jonny Bull and all!” John Bull, the central figure, reads a pro-McClellan and Davis issue of the “London Times.” At bottom left New York governor Horatio Seymour holds a plaque reading, “All ye desiring peace come one, come all. The War proved to be a failure.” On the right New York congressman Fernando Wood, another prominent Copperhead, extends his hand to the viewer with the invitation “All true friends of Slaves and their Masters should join our Company.” The print compares closely in drawing style, in format, and in its anti-Democratic bias to “Democracy. 1832. 1864.” (no. 1864-23), published by Prang & Company. Both prints were probably drawn by the same artist.